For nearly 35 years, while the art world has hemmed and hawed, painter Sandra Mendelsohn Rubin has steered a steady course. 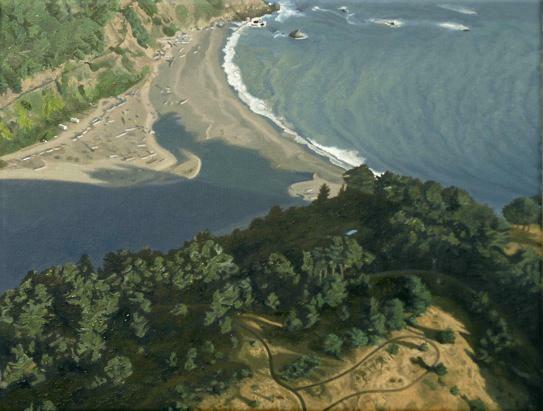 As Rubin's subject matter has progressed -- most recently Rubin has been painting aerial views -- her technique has remained consistently spellbinding. Rubin builds up the surfaces of her work with undiluted, unglazed layers of oil paint applied with uncanny precision. The resulting paintings, which are often small in scale, demonstrate the artist's deeply felt exploration of her surroundings and also her sense of their underlying energies. "For me," Rubin explains, "witnessing nature coming to life at the tip of my paintbrush is a humbling and moving experience. That being said, I think it is what you don't see that gives the paintings their power." In order to fully understand and appreciate Rubin's recent work I recently asked her to tell me about her background, the long path of her career, and her recent interest in aerial views. 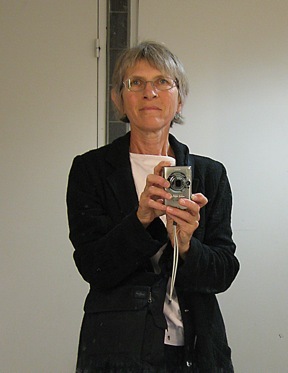 Sandra Mendelsohn Rubin I understand that you earned both your undergraduate and graduate degrees at UCLA, finishing in 1979. Who did you work with while you studied there? The faculty members I worked with mostly were Sam Amato, Elliot Elgart, William Brice and James Doolin. James Valerio was my graduate committee chair. Jim Doolin was great. In terms of actual technical information -- the how-to of painting -- he was the most helpful. 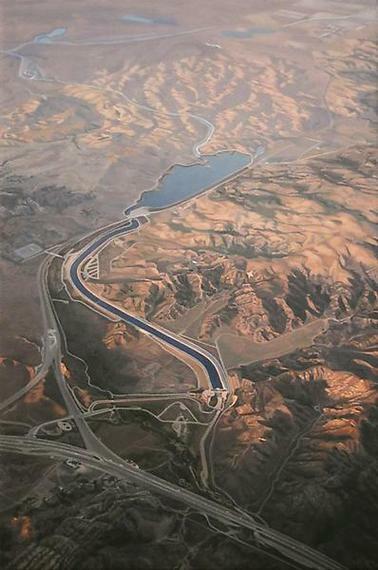 I visited his studio at that time: he was in the middle of working on his ambitious aerial view of Santa Monica Mall. Jim was so open in sharing his work process. It was invaluable to take in first hand. After UCLA, Jim became a life long friend. Although Bill Brice was not on my graduate committee he was a big influence. 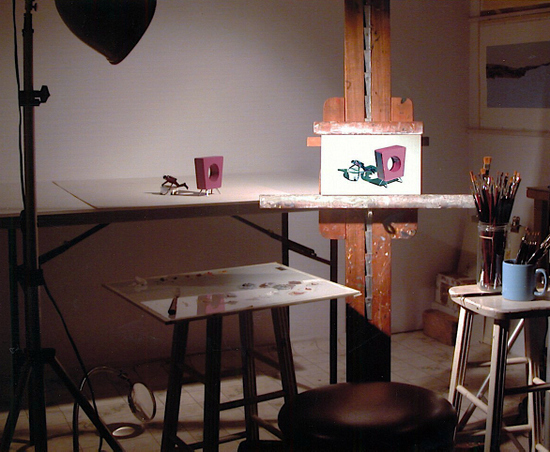 After UCLA, I visited Bill Brice's studio a few times: a rare invitation I am told. We would visit over lunch regularly. Louver took him on right after I graduated, around the same time I became associated with the gallery. He went from professor to colleague overnight! He was always so supportive and insightful. And, I also continued to have some contact with Sam Amato. He was a very sweet soul and a wonderful, perceptive being in every way. During grad school, weren't you one of a very few representational artists? Yes: we were few. While representation was not the popular mode of work at the time, I did get lots of encouragement: including scholarships and acknowledgement. There were three or four representational artists in graduate school at that time, but not in my graduating class. 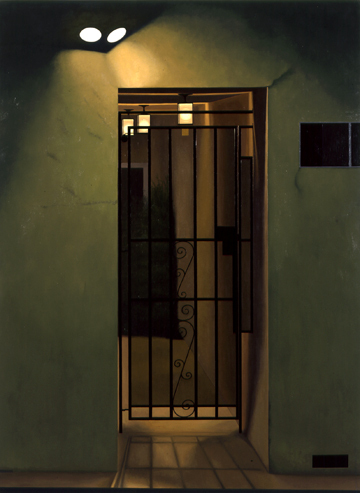 Apartment Gate, 60 x 44 inches, oil on canvas, 1980 Am I correct that you also had considerable success right out of school, including your winning of the LA County Museum of Art's prestigious "Young Talent Award" in 1981? Yes, and my association with LA Louver Gallery, where I still show, also began in 1981. The award came with an exhibition that took place in 1985. 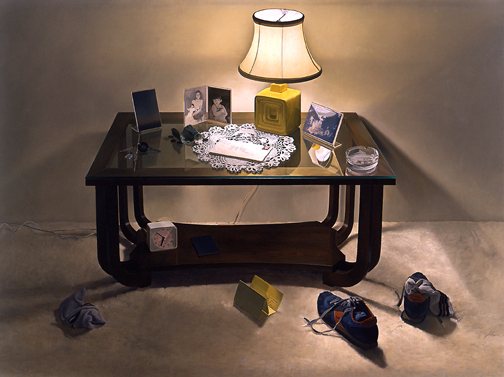 The Letter, 36 x 48 inches, oil on canvas, 1982 I remember the mid-eighties as a vibrant time for the LA Art scene: For example, MOCA opened in late 1983, not long before you had your show at LACMA. I would agree, there was a lot going on at that time. But I was young: my memory is notoriously spotty! Your work in the 80s often dealt with the city and the landscape surrounding it. Landscape has always been a pull for me. If you focus on the structure of the city paintings, they are balanced around the rhythm of the trees and foliage. The natural elements are pivotal to the compositions, including the quality of light and atmosphere. I have to mention here that my earliest recognition came from the night paintings I did at this time. 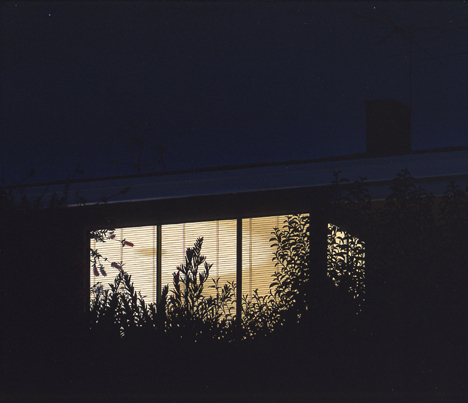 It is a subject I come back to again and again: "The Bungalow", which was included in my last show at L.A. Louver Gallery in 2011, is a good example of my continuing interest in nocturnal imagery. The Bungalow, oil on polyester, 45 x 95 inches, 2009 - 2010 How did you find places to paint? When I was in LA, I bought a step van about the size of a parcel post truck. It was originally a small school bus. I took out all the seats except for one and converted the interior into a portable studio. As it had been a school bus, the sides were lined with windows that opened down, perfect for observing in a standing position at my trimmed-to fit easel. I used that to paint on-site for 13-14 years. I would go out and park it on location, do a smaller piece and bring it back to my studio in Venice. I would use the study done on site as my reference for a larger painting. Untitled, 33 x 45 inches, oil on canvas, 1987 The idea for the portable studio came about to facilitate a work I wanted to do at night. 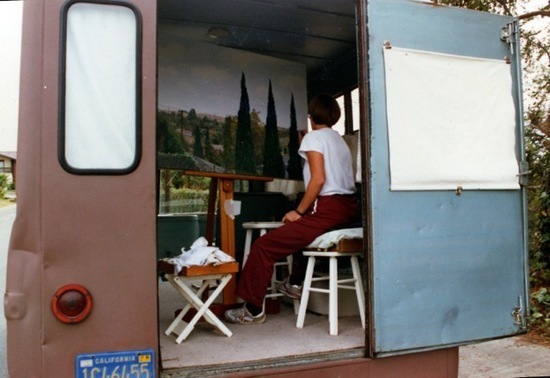 The first painting I did in the van was "Malibu Window." In addition to working from the van, I also worked out in plein air. Malibu Window (study), 12 x 14 inches, oil on canvas, 1981 When did you decide to move to Mendocino County? My husband, Stephen, and I moved in stages around 1988. The decision was complex. To leave Los Angeles and move 500 miles away to a very rural area really shook things up. I wasn't here full time until 1990. I was still finishing up the last of my L.A. landscapes when we moved. A close friend and Venice neighbor moved here to the Anderson Valley in '81-'82 - when things were really taking off for me. After her move, we maintained our friendship. I would bring my portable easel when we would come to visit. I did several paintings here before we ever considered this as a place to relocate. When I was working in Los Angeles, accessing the city landscape was always a challenge. In addition to finding locations that struck a chord, there were multiple considerations that came into play. When in my van, I had to select a place with a predictable parking space in a safe location as the paintings could take as much as 4 - 6 weeks to complete. Before I would start, I would inform the closest neighbor who I was and what I was up to. With repeated parking in my funky van, people could easily mistake my intentions: and they did! After a couple of close calls early on, safety was always a primary issue. While I still love L.A., painting there got to be frustrating and so much work. Accessing what I wanted to paint became difficult. 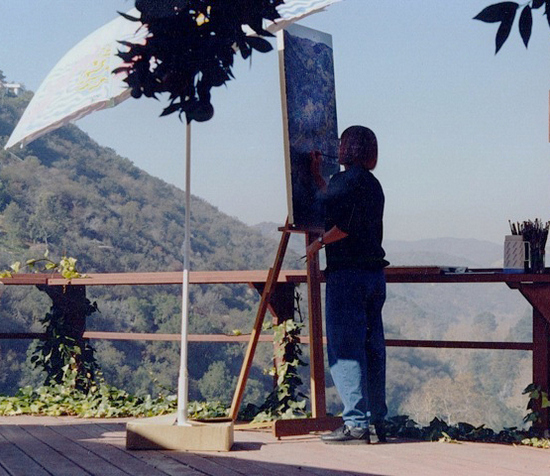 Working on a study for "Canyon View in the Fall," in 1989 How did moving change your work? Working here was so freeing: the practical and safety concerns that had been part of working from the van were gone. That being said, once we moved here, other challenges came into play. It took years of getting familiar with rural life and living through the seasons for this to become "home." For quite some time I was overwhelmed. As a result, I returned to the still life and started to bring things inside. I spent years working in the studio before stepping out into the landscape again. The resulting still life paintings culminated in an exhibit -- Shapes & Shadows: Still Life Paintings, 1994-2003 -- accompanied by a catalogue. Paintings come out of life and life needed to be lived here before I could find a path into this landscape. I was well aware of not wanting to become a romantic scenic painter! The work has to connect on a deeper level. A great deal of your work is quite small in scale. Have you always preferred to work in a small format? Through the years, there has always been a mix of large and small. The idea defines the scale. Small work addresses the mind and imagination directly while large scale adds physicality and drama. There's a place for each and the mixture over time has been pretty consistent. The current show of almost all small scale paintings is really the exception. The intermittent commitment to small work keeps the momentum going. In the current show, it allowed me to do major paintings in a reasonable amount of time. I have found, in following this trajectory, that the smaller scale is an even more powerful way to touch deeper and deeper space. But large paintings also have their place. There are two in progress in the studio now waiting for my attention! Yes, in the past few years I have made the leap to using digital photographs to supplement working exclusively from life. It has given me access to a world of material that would otherwise be intangible. My years of working as an 'observational' realist have enabled this shift without sacrifice: in fact, it has been empowering! 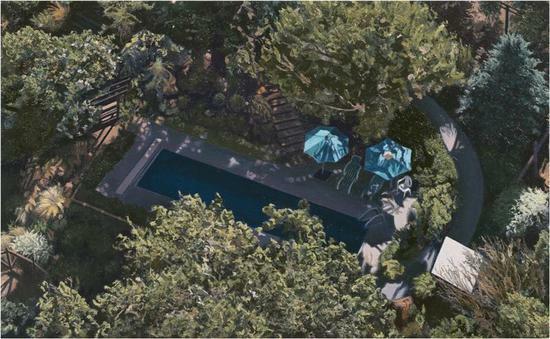 Without the aid of photography, gathering the raw material for these aerial perspectives would never have been possible. To see the human presence in the context of the natural environment has opened an arena of metaphors and ideas. In the end though, intuition and memory are what shape and form each painting. 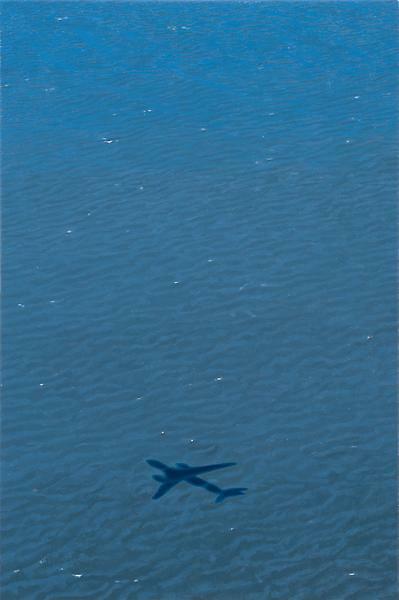 Landing at SFO, 13 1/2 x 9 inches, oil on polyester, 2011-2012 How did your interest in aerial views come about? Let me step back in time for a moment. My last show in 2011 included a triptych titled "Above and Beyond". 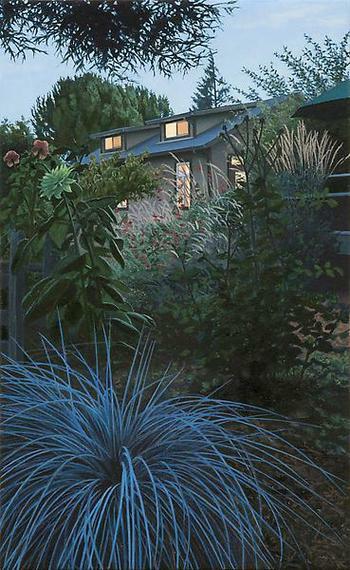 I had this idea to do a painting of my studio and garden in the context of the surrounding environment at twilight. The idea for this first aerial originated when flying back from L.A. to Santa Rosa. As the plane descended for landing, we flew over a sprinkling of outlying homes surrounded by land. As it was almost dark, each home became an island of illumination ringed by barely visible rural terrain. This image made a deep impression and I was compelled to try and capture something akin to that here. In order to gather the raw material to do this, I hired my friends at Aerovantage -- Steve Unz and Henrik Kam -- to come and take pictures from an elevated perspective. Their specialty is to use a remote controlled micro-copter with a mounted camera. As the micro-copter is flown about, the camera is controlled from the ground by a lap-top computer. 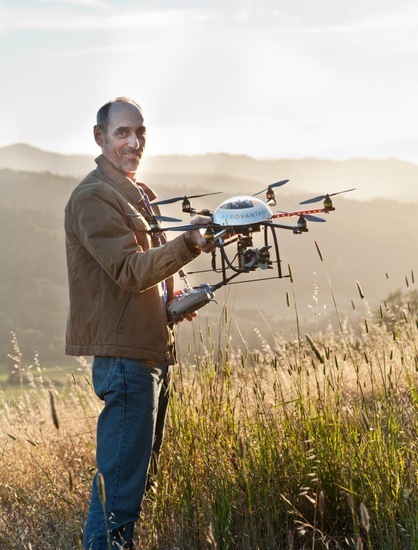 Steve Unze with his micro-copter: Photo courtesy of Aerovantage They are an amazing team these two! But because I wanted this painting to be at twilight, they needed to keep the camera stable. So instead of the micro-copter, they mounted the camera on to a 50 foot stationary mast, basically a giant tripod. Shooting at low light level, the mast made this possible. The mast setup: Photo courtesy of Aerovantage Once set up, we took several pictures in a sweep of the house, studio and valley beyond with the camera controlled on the ground. We started at sundown and continued shooting in a sweep until dark. As a result, I had all these pictures of the same information in progressive degrees of darkness. From that I was able to piece together a composition and painting. Above & Beyond Oil on polyester, 19 x 36 inches, 6 x 46 1/2 inches and 11 x 5 1/2 inches, 2010 - 2011 After the 2011 exhibit, I hired my friends once again, this time using the micro-copter. They came for an overnight and did several flights before sundown and then again in the morning after sunrise. Out of the zillion pictures they took, I got two paintings. In "Portrait of Home" I wanted to show our small cluster of "civilization" in relationship to the surrounding natural environment. Portrait of Home, 4 x 15 inches, oil on polyester, 2011 In the cool of morning light, "Pool" is the first painting I did focusing on the subject of water. Pool, 5 1/2 x 9 inches, oil on polyester, 2011 It's remarkable that you went to so much trouble to gather the information you needed. While a lot of work, I learned so much in the process of gathering the raw material in a new way. After all these years of working exclusively from life, using digital photography like this has expanded my working process, stretched my imagination, and opened a world of new material otherwise inaccessible. Quail Lake, 13 1/2 x 9 inches, oil on polyester, 2012 As my interest in exploring the subject of water has continued, my good friends at Aerovantage offered to help once again. This time, Steve Unze came in his small plane. 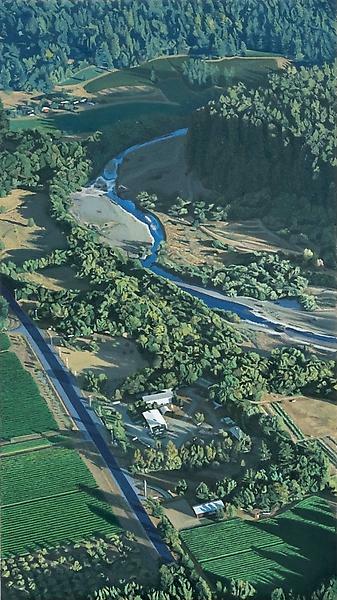 We took off from the landing strip in Boonville in the late afternoon, and flew northwest following the river through the valley all the way to the mouth at the coast. As we flew, Steve would circle around areas that captured my interest, banking the plane to increase my visibility so I could take pictures with as little wing interference as possible. Steve Unze's plane: Photo courtesy of Aerovantange Once again, I was flooded with a zillion pictures. They sat in my computer for a couple of years while I completed "Quail Lake", "Turbulence" and "Landing at SFO", three additional water related paintings. At first, these photos felt unusable, each with vast amounts of information, all just too much to use. But as I combed through them over and over, I started to see small sections that had potential. In the end, I was able to garner four precious paintings out of this adventure. 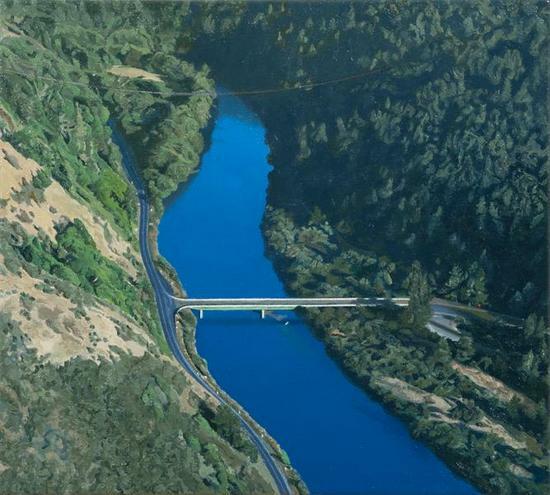 Following the River, 10 1/4 x 5 3/4 inches, oil on polyester, 2013-14 As the years accumulate and the work evolves, my scope and focus have both expanded and compressed and my engagement with atmosphere continues. 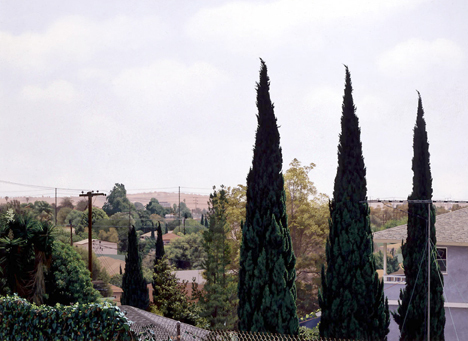 Horizontal Clouds, 6 x 46 1/2 inches, oil on polyester, 2008 Increasingly, each painting builds on the next with the size and shape determined by the focal point of the composition as well as how they read in relationship to each other. I choose my subjects with utmost care as these paintings take time. They must continue to resonate for me on a personal level to sustain my attention. There has to be depth in more ways than one. I notice that you have been painting on polyester. Why did you choose it over canvas or linen? Polyester fabric for painting was recommended to me by John Annesley, the fellow who makes my surfaces. His firm -- The John Annesley Company -- is located in Healdsburg and does excellent high quality work. At his business, he has a room filled with different types of fabrics for painting. John encouraged me to try this fabric made by Artfix: it is of the same quality and feel as their pre-primed portrait linen. You can't tell the difference, well, except for being nub free! Can you tell me about other artists whose work you admire? In the historic arena, I would say Vermeer, especially the "Girl in a Red Hat". It is a magnificent painting and measures only 9 1/8" x 7 1/8". I love that too! I still look at Monet from time to time, as well as a Rembrandt self portrait, Van Gogh and on occasion, Matisse. I recently saw a show at the de Young in San Francisco of Andres Zorn, a Swedish artist (1860-1920) who I was unfamiliar with. His watercolors blew me away. I also love the work of Richard Diebenkorn, Peter Doig and Jim Dine. Of course, I admire a handful of other representational painters: in particular, Rackstraw Downes, Catherine Murphy, Antonio Lopez Garcia, and the late Claudio Bravo. Those are the ones that come to mind. I am looking forward to this trip to New York. There is so much out there, one can only be aware of so much! 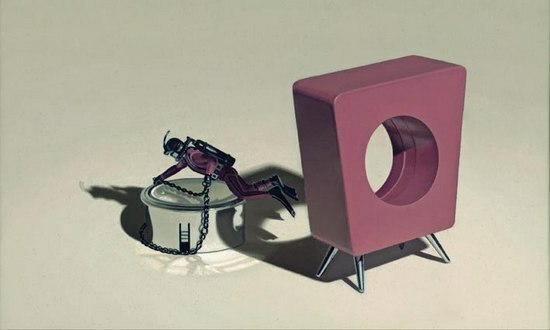 It seems to me that there is increasing interest in representational painting right now: are you seeing the same thing? Yes, it is a welcomed surprise. 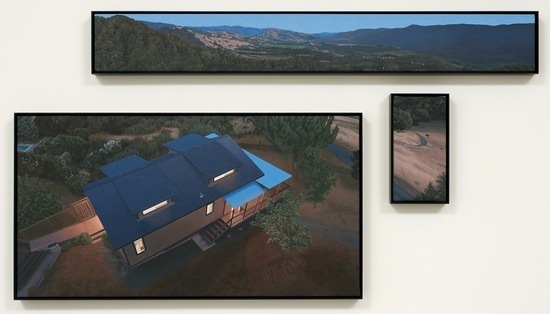 On April 24, the same day my show opens at Ameringer McEnery Yohe in New York, Rackstraw Downes is having an opening as well as April Gornik. It will be such a treat to see both of their exhibitions. William Beckman also has a show up as well as Mark Innerst at D.C. Moore. I am sure there is more going on than I am aware of. To see respect and interest in representation once again is all good. As Diebenkorn so aptly put it "... a realistic or non-objective approach makes no difference. The result is what counts."